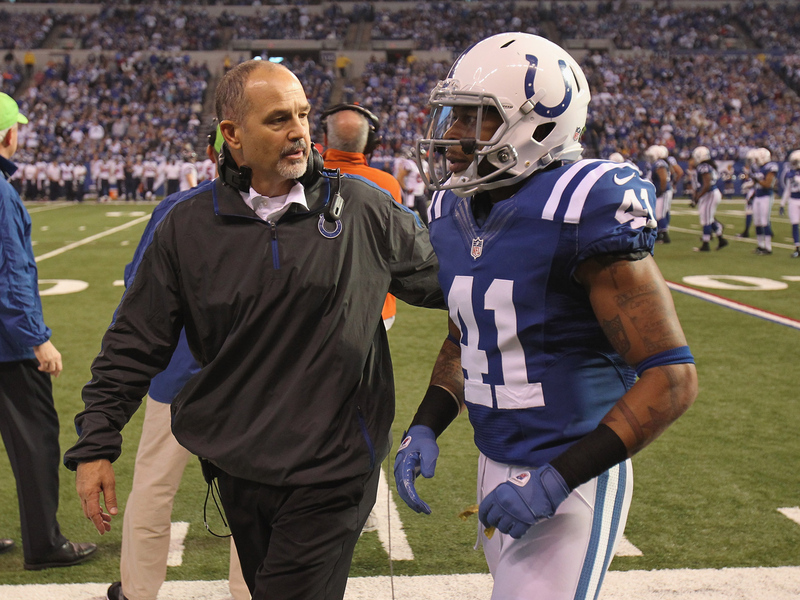 INDIANAPOLIS The Indianapolis Colts made Chuck Pagano a winner in his return to the sideline. Andrew Luck threw for two touchdowns and Deji Karim swung the game with a 101-yard kickoff return in the third quarter, giving the Colts a 28-16 victory over Houston. It was Pagano's first game back as coach since starting treatment for leukemia Sept. 26. Indianapolis (11-5) heads into the playoffs as the No. 5 seed and on a roll. The Colts will open the postseason next weekend against the Baltimore Ravens. Slumping Houston (12-4) won't know its playoff seed until later Sunday. The Texans lost three of their last four games, and J.J. Watt failed to break Michael Strahan's single-season sacks record. The game turned on two big plays: Karim's kickoff return, which wiped out a 16-14 Houston lead, and Luck's 70-yard TD pass to T.Y. Hilton. CINCINNATI Carlos Dunlap returned an interception 14 yards for a touchdown in the fourth quarter. The Ravens (10-6) had already clinched their second straight AFC North title, and they will open the playoffs at home against Indianapolis, which defeated Houston on Sunday. The opponent for the Bengals (10-6) was to be determined later Sunday. The Ravens let quarterback Joe Flacco and running back Ray Rice play only two series. Bengals quarterback Andy Dalton and receiver A.J. Green sat out the second half. DENVER Peyton Manning threw for 304 yards and three touchdowns to lift Denver into the No. 1 seed for the AFC playoffs. Manning finished the season with 4,659 yards, 41 short of his career high. He finished with 37 touchdown passes, and none will be more memorable than the last two  circus catches by Eric Decker and Demaryius Thomas that turned the game into a blowout. Denver (13-3) won its 11th straight and leaped past Houston for the top seed after the Texans lost to Indianapolis 28-16 earlier in the day. The Chiefs gained only 119 yards all day and finished their season 2-14. They will get the top pick in April's draft. MINNEAPOLIS Adrian Peterson came within 9 yards of Eric Dickerson's rushing record, finishing with 199 yards and powering Minnesota into the playoffs. The result forced a rematch with the Packers next weekend in a wild-card game  this time at Lambeau Field. Peterson rushed for 36 yards on the last drive, plenty for rookie Blair Walsh's 29-yard field goal as time expired to put the Vikings (10-6) in the postseason. The Packers (11-5) fell to the NFC's No. 3 seed. Aaron Rodgers completed 28 of 40 passes for 365 yards and four touchdowns and no turnovers, connecting with Jordy Nelson from 2 yards to tie the game with 2:54 remaining. But Christian Ponder threw for three scores, including one to Peterson. SAN FRANCISCO Michael Crabtree caught touchdown passes of 49 and 7 yards as the 49ers won a second straight NFC West title. Colin Kaepernick threw for a career-best 276 yards and two TDs as the Niners (11-4-1) earned a No. 2 seed thanks to Green Bay's loss to Minnesota. Frank Gore ran for a 2-yard touchdown early in the fourth quarter for his franchise-best 51st touchdown rushing. Brian Hoyer went 19 of 34 for 225 yards and a late TD toss in his first career NFL start as Arizona's fourth quarterback. The Cardinals (5-11) lost for the 11th time in their last 12 games in what might have been Ken Whisenhunt's final game as coach. SEATTLE Russell Wilson tied Peyton Manning's record for most touchdown passes by a rookie with 26, and his 1-yard TD run with 1:39 left allowed Seattle to finish as the only unbeaten team at home. Seattle (11-5) entered the day with hopes of still winning the NFC West and getting a home playoff game, but those dreams were dashed when San Francisco beat Arizona. Seattle will be the No. 5 seed and face the NFC East winner  Washington or Dallas  next weekend. The Rams (7-8-1) sacked Wilson six times, but couldn't come up with their first winning record since 2003. FOXBOROUGH, Mass. Tom Brady threw two touchdown passes and New England earned a playoff bye. Stevan Ridley ran for two touchdowns as the Patriots used a ball-control offense and a defense that racked up a season-high seven sacks. Now, seeded second in the AFC, they have an extra week to savor the win and prepare for their postseason opener. ATLANTA The Falcons couldn't follow through with their plan to gain momentum for the playoffs as Josh Freeman threw a touchdown pass to Mike Williams and Doug Martin ran for 141 yards. The danger to Smith's strategy was losing a top starter to an injury. Defensive end John Abraham, Atlanta's best pass rusher, left with an apparent left ankle injury in the fourth quarter. Cornerback Dunta Robinson suffered a head injury in the first quarter and did not return. DETROIT Jay Cutler threw for 257 yards and a touchdown and helped seal the game with a late scramble. Chicago (10-6) needed a Minnesota loss to Green Bay to reach the postseason. Cutler's 19-yard run on third down helped Chicago run out the clock late in the fourth quarter. EAST RUTHERFORD, N.J. There will be no Super Bowl repeat for the Giants. Not even a playoff berth despite Eli Manning's career-high five touchdown passes. The Giants (9-7) playoff hopes ended minutes after routing the Eagles. Chicago's win over Detroit ended New York's long-shot playoff chances. Eagles coach Andy Reid is out after 14 years at Philadelphia, three people familiar with the decision told The Associated Press. The official announcement could come Monday. The loss means that it will be seven straight seasons that the Super Bowl champion has failed to win a playoff game the following year. Philadelphia closed the season 4-12. PITTSBURGH Ben Roethlisberger threw three short touchdown passes, and Pittsburgh avoided its first losing season in nearly a decade. Antonio Brown, Leonard Pope and Plaxico Burress scored for the Steelers (8-8). Pittsburgh's top-ranked defense forced four turnovers as the Steelers won for just the second time in the last six weeks, a slide that knocked them out of the playoffs for the first time since 2009. Cleveland's third-string quarterback, Thaddeus Lewis, passed for 204 yards with a touchdown and an interception in his first NFL start. But the Browns (5-11) dropped their third straight in what is likely coach Pat Shurmur's final game. ORCHARD PARK, N.Y. C.J. Spiller scored on a 66-yard catch and run in helping underachieving Buffalo, while Jets quarterback Mark Sanchez had two more turnovers. Safety Bryan Scott also returned an interception 20 yards for a touchdown for the Bills (6-10), who snapped a three-game skid. Both AFC East rivals had already been eliminated from playoff contention. The Bills finished last in the AFC East for a fifth straight season amid speculation about coach Chan Gailey's job security. Sanchez may have started his final game for the Jets (6-10), who closed the season with three consecutive losses amid all sorts of turmoil. NASHVILLE, Tenn. Tennessee became the first NFL team with two players scoring twice on returns in closing out the season with two wins in its final three games. Darius Reynaud scored on two punt returns and rookie linebacker Zach Brown returned two interceptions for touchdowns. The Titans finished 6-10 and await owner Bud Adams' decision on whether to keep coach Mike Munchak, who has two years left on his contract. The Jaguars (2-14) wrapped up their worst season with their 12th loss in 13 games, and now owner Shad Khan has to decide on the futures of general manager Gene Smith and first-year coach Mike Mularkey. NEW ORLEANS Drew Brees made more NFL history, but so did the Saints' porous defense in a loss to Carolina. DeAngelo Williams rushed for 210 yards, including touchdown runs of 54 and 12 yards, for Carolina (7-9), which closed the season with four straight wins. His 65-yard gain set up the first of three 1-yard scoring runs by Mike Tolbert. The Saints (7-9) also gave up 530 yards, raising their season total to 7,042 to break the record of 6,793 allowed by the 1981 Baltimore Colts. SAN DIEGO Micheal Spurlock returned the opening kickoff 99 yards for a touchdown on wet, gloomy day in what's expected to be Norv Turner's final game as Chargers coach. Turner and general manager A.J. Smith are expected to be fired because the Chargers (7-9) missed the playoffs for the third straight season. The Raiders finished 4-12. Spurlock became the first Chargers player to have a kickoff and punt return for touchdowns in consecutive weeks. He returned a punt 63 yards for a touchdown a week earlier in a victory against the New York Jets.